I’m pleased to announce the immediate release of Xtorrent 2.1. This new version of Xtorrent comes after months of extensive testing, and contains substantial performance and stability improvements. This is a free upgrade for registered users. Xtorrent 2.0 (v96) gains some new search display options today, to help users more easily understand search results. “Cluster results by search site” presents your results in a tree view that structures results by the search sites that delivered the result. “Highlight search keywords” visually emphasizes the search keywords you used for your search. These new display modes are entirely optional and easily toggled on and off using keyboard shortcuts. In addition to these changes, Xtorrent 2.0 (v96) brings some search-related memory optimizations and a slightly de-cluttered tab view. Download Xtorrent 2.0 at the website. Xtorrent 2.0 has been under intensive development recently. There have been over 40 releases since the first 2.0 builds in August. I’ve tended to mention each update to the fans on the Xtorrent Facebook page rather than on this blog, but for the sake of keeping everyone informed, I thought I’d highlight some of the more important changes made in the last few days and months. Xtorrent 2.0 v94 is the latest feature release, bringing Quick Look support to Xtorrent. Just like in the Finder, you can hit the spacebar on any selected file in a download and it will pop up a Quick Look preview of the content. If it’s an image, you’ll see the image. If it’s an audio file or movie, it’ll start playing right within Xtorrent. Naturally, this works best when the file is completely downloaded, but for many file types it can still present a reasonable preview even if the download is still in progress. Xtorrent 2.0 v90 saw the introduction of support for magnet: links, an emerging standard that some websites are starting to use. These are convenient because with a single click you can have Xtorrent open immediately, ready to start downloading the torrent. The problem is that these links lack any torrent metadata (the description of the files and content of a torrent), so it’s necessary to find the torrent first before any data can start to flow. However, Xtorrent’s clever design means that in most cases the torrent can be located and started within seconds. Xtorrent 2.0 v88 added a randomize port preference and saw an overhaul of the port-mapping system, meaning the last remnants of open source code in Xtorrent (the miniupnp port mapping library) could be swept away. Xtorrent 2.0 v85 saw the addition of a DHT (distributed hash table) system for finding peers based purely on the torrent’s unique identifier, without needing to talk to a tracker. This supplemental system for finding peers means more peers for everything – normal torrents, trackerless torrents, and torrents whose tracker is unresponsive. 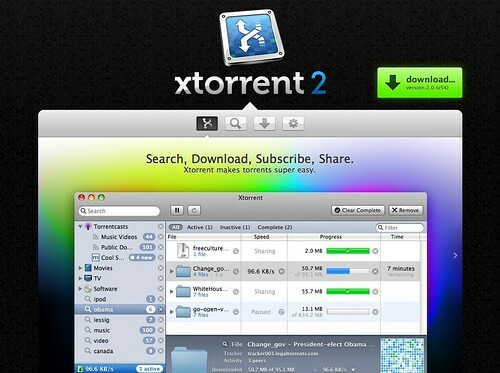 Xtorrent 2.0 v77 was the first 64-bit release of Xtorrent and brought big performance benefits, especially for users on Mac OS X 10.6 Snow Leopard. Since then, additional optimizations for 64-bit have been added. All along the way there has been a constant attention to performance (CPU usage, memory usage, and network speed), with the goal of having an app that runs incrementally faster every release. Xtorrent can be downloaded from the Xtorrent website. Be certain to purchase Xtorrent Pro to get the most results and fastest downloads. 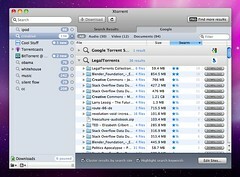 NewsFire and Xtorrent run great on Mac OS X 10.6 Snow Leopard! I’ll keep this short. Xtorrent 2 is now available as a public preview from the Xtorrent 2 preview website. This has been extensively tested over the last two weeks by private testers (many thanks!) and is in good shape for wider testing. That said, I’m sure there are bugs. There’s at least one important feature yet to come in the coming days. Constructive feedback is appreciated at feedback@xtorrentp2p.com. The last year has been crazy busy – Inquisitor got bought by Yahoo! and became the focus of my attention in the following months. It was eventually ported to two new browser platforms (IE and Firefox), and was also re-conceptualized as an iPhone app (all of which I’m proud of). For those months my time was under contract to Inquisitor, with side projects like Ski Lodge, NewsFire 1.6, and Safari140 squeezed into the weekends. The consequence was that my core projects received less attention than they deserved. The good news is that time pressures have changed. Xtorrent is now my priority and after many months of teardown and reconstruction, the next major release of Xtorrent is imminent. Let’s dive right in… Xtorrent 2 features a brand new torrent engine named Xcore. This engine has been designed exclusively for Mac OS X and written in 100% Cocoa. The result is a lightweight, powerful, and very stable download engine that supports torrent extensions such as encrypted message streams. I made the choice to use the very latest in Cocoa technologies, hence Mac OS X Leopard is now a requirement. Xtorrent 2 opens up the search feature. In Xtorrent 1.x, search was a closed box over which the user had no control. Xtorrent 2 changes this by letting the user opt in or out of specific search providers, and even extend it by adding their own. In the user experience department, Xtorrent 2 is more refined than its predecessors. One improvement is a super simple downloads queue along with inline controls that make it easier to pause and resume downloads. Other changes include better search suggestions, refined graphics, Twitter support for sharing torrents, and significantly improved performance in key areas. 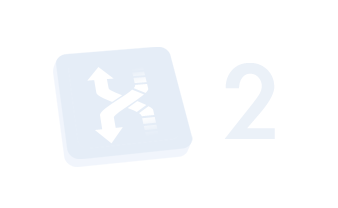 Xtorrent 2 will be released initially as a private preview in the coming days. As soon as any rough edges are smoothed out it’ll be released more widely. Feel free to check out the redesigned website for more details and screenshots. Also, follow us on Twitter or Facebook for news updates. Today, we’re pleased to announce that Inquisitor is now available in 11 additional countries: Canada, the UK, France, Germany, Italy, the Netherlands, Spain, Sweden, Switzerland, Australia, and New Zealand. Please check it out on your local App Store – we hope you enjoy it! If your country isn’t on this list, stay tuned and we’ll keep you up to date as the rollout continues. It took far too long for reasons I’ll never know, but Apple has finally approved the Inquisitor app for the iPhone. Late last year, I released my first iPhone app, Ski Lodge, which brought a unique experience to skiers and snowboarders with the iPhone’s combination of GPS, 3G, and rich user experience. While Ski Lodge was my first iPhone app to make it out the door, it was not the first iPhone project I began working on. That particular honour goes to today’s announcement – Inquisitor for iPhone. The iPhone is a unique platform with many strengths, but also many limitations. A small screen means that app design needs to be uncluttered, direct, and essential. Sometimes slow and error-prone keyboard entry means that search aids are critical. Slow website loading speeds mean that users cannot afford too much back and forth. It turns out, these limitations map well to Inquisitor’s strengths. Inquisitor’s central premise is that providing a native search experience can provide a better, more direct way to navigate to the information you want. Visiting a webpage just to find another webpage, with all the hunting, pecking, pinching and tapping that entails, can get tiresome quickly. Inquisitor has always been about speed and simple design. Instant search suggestions attempt to complete your thoughts and save you from the keyboard. Results are designed to be easily read on the iPhone screen, so there’s no need to hunt and peck. 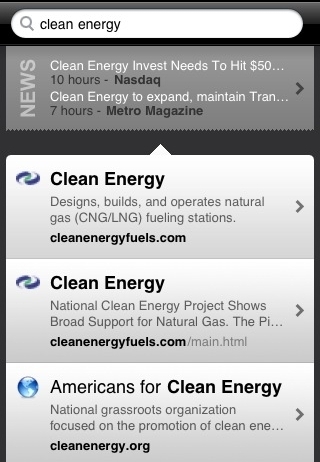 A built-in web browser means you can flip between search results and web pages with a single tap. There’s even an extended abstract preview that hovers over webpages while they’re loading, so you’re never left staring at a blank screen. On top of it all, Inquisitor remembers your history and personalizes the experience to you. You can get it from iTunes. At the moment it is only in the USA store, but we’re working to get it launched everywhere once a few legal hurdles are passed. Oh, and it’s free ($0.99 is so lame).